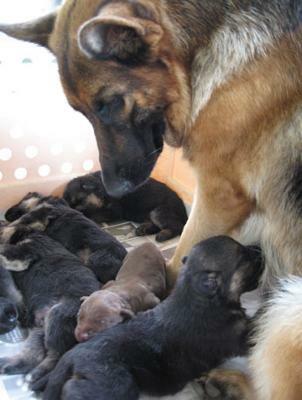 German Shepherd Momma Adopts a Baby Lab Too! At the beginning there was a little bit anxiaty, but right after Quana liked her, she understood everything would be ok…so Quana and the 5 puppy litter adopted this little sister!!! Quana was an extraordinary mother, and with her nurture and the help of playful German Shepherds siblings, Brownie the lab grow up to become a real smart little girl…because she was 2 weeks younger than the litter she develop abilities faster than other puppies I had seen before…adaptation for survival! Hope u like the pic! And congrats I love your page! Comments for German Shepherd Momma Adopts a Baby Lab Too! Please keep sending in pics as they grow up. Would like to see what kind of bonding goes on. Who gets the lab after it is weaned?